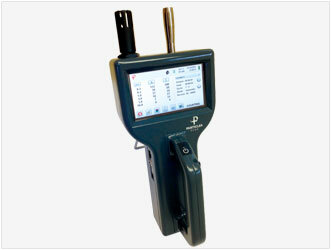 The Particles Plus 8206 Handheld Particle Counter measures 0.2 um to 10.0 um with a flow rate of 2.83 LPM (0.1 CFM). Easy to configure, this instrument displays up to 6 user-selectable size channels as well as temperature and relative humidity. View data and generate ISO 14644-1, EU GMP Annex 1 or FS 209E reports on screen or via printer, USB key, Wireless and real time through its versatile output options or export to Particles Plus data-download software. Particles Plus counters can be controlled and monitored remotely via web browser. The 8206 has a mass concentration mode that reports density in ug/m³. The Handheld Particle Counter 8206 enables the user to change between Imperial and Metric Units form the touch-screen on-the-fly. Particles Plus engineers and manufactures feature-rich particle counter instrumentation and vacuum pump technology for the Indoor Air Quality, Semiconductor, Life Science, Aerospace and Data Storage industries. Please contact us for further information on the Particles Plus Product Range and for technical advice regarding your particular application.